This seems automatically dubious as neither the graphic nor the associated tweet cites any source for the data. Also pretty much all of the claimed percentages strike me as too high to be realistic, regardless of who or how immoral the president at the time of the survey happened to be. Is this claim completely made up, or is it reporting an actual survey result (and if it is, is it doing so accurately)? 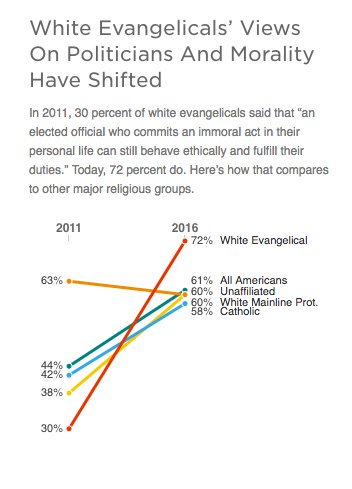 The source is this poll from PRRI, and the image is from this NPR article. The NPR article puts this in the context of the 2016 election and especially evangelicals wanting to vote for Trump despite his "sexual misconduct". In this context, the spike does not seem unreasonable. Not the answer you're looking for? Browse other questions tagged united-states politics statistics . Does Barack Obama have an aunt who was a homeless illegal alien that used government housing for 10 years?